In the early 1960s, with the national revival in Soviet Armenia, the Communist regime had to confront pockets of dissident thinking. The monolithic rule of the party was questioned by people who thought in terms of freedom of thought and speech. Some of the banners in the April 24, 1965 popular demonstrations in Yerevan on the fiftieth anniversary of the Armenian Genocide asked for the release of the “seven patriots” who had been imprisoned in 1964 for anti-Soviet activities. Painter Haykaz Khachatryan (1920-1989) and a group of sympathizers made a demonstration on that day near the tomb of Gomidas Vartabed at the Yerevan Pantheon. They were arrested, but released a few days later due to lack of evidence. During his detention, Khachatryan garnered several adherents to his ideas, among them Stepan Zatikyan, a student of the Polytechnic Institute, and Shahen Harutyunyan. On April 24, 1966, Khachatryan proposed the creation of a party, the National United Party (NUP), in opposition to the monolithic rule of the Communist Party. The core of the party was formed in a few days, with several clandestine youth organizations joining the National United Party. The new party produced its bylaws and program of activities. On April 24, 1967, the declaration of the NUP was presented in an event near the nearly finished genocide monument on the hill of Tsitsernakaberd. The first members of the party made their sacred pledge to be faithful to the ideas of the party. The NUP Council became the leading body of the party. All members should closely follow the program of the party, entitled “For the Nation and the Homeland.” Any person aged sixteen, who accepted the program, the bylaws, and the sacred pledge, could become a party member. Its structure was composed of ten-member groups, which did not maintain contact and did not know each other. Each group had a leader, who knew the other group leaders, as well as their main leader (captain). The goal of this structure was to maintain the secrecy in the activities of the group. 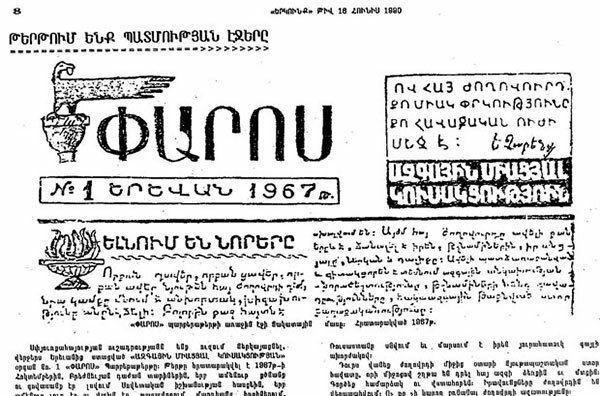 The publication made waves not only in Armenia and the Soviet Union, but also abroad. It disclosed the existence of the party to all quarters where anti-Soviet movements were being formed. Paros was indeed forbidden and labeled as anti-Soviet. Its writers and readers were persecuted. New members joined the National United Party, but this became the cause for its fall, as traitors entered the field. 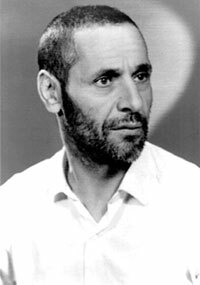 Khachatryan was arrested in June 1968, together with Zatikyan and Harutyunyan, and condemned to five years of prison by the Supreme Court of Armenia on charges of anti-Soviet agitation and participation in an anti-Soviet organization. Khachatryan would be released in 1973 and imprisoned again from 1978-1980; Zatikiyan would be released and then shot by the Soviet regime in 1979; Harutyunyan would later migrate to California and head a movement of support to Armenian dissidents and political prisoners. 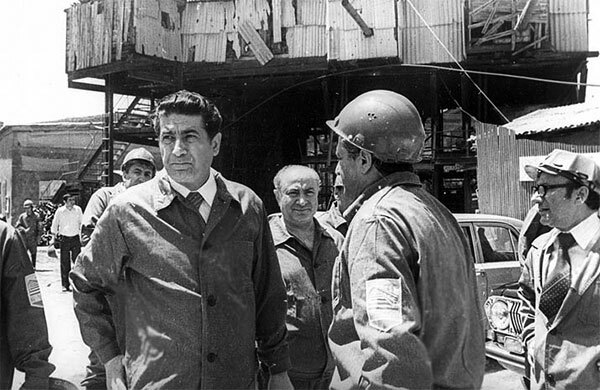 After the imprisonment of its founding leaders, Paruyr Hayrikyan became the leader of the NUP, but he was also arrested in 1969 and condemned to four years of prison. During a brief interval in freedom (1973-1974), he was able to publish a second issue of Paros and produce a revised program of the party, where all anti-Soviet references were eliminated. The fundamental course of struggle for independence via legal provisions remained untouched. The claim of a popular referendum for separation of the Soviet Union, as established in the Soviet Constitution, would be legally carried out two decades later with the September 21, 1991 referendum that decided the independence of Armenia. 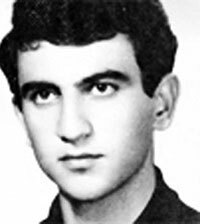 Hayrikyan was elected president of the party in 1973. He was arrested again in 1974 and spent the next thirteen years in prison, continuing clandestinely to lead the organization. On his return to Armenia in August 1987, he founded a successor party to the NUP, the National Self-Determination Union, which was quite active in the first years of the Gharabagh movement and still continues its existence as a political party. Other members of the National United Party would become leaders of the Gharabagh movement, such as Movses Gorgisian (1961-1990), or the Republican Party of Armenia, like its founder Ashot Navasardian (1950-1997), or future prime minister Andranik Margaryan (1951-2007). Karen Demirchyan was a noted name in post-Stalinist Soviet Armenia and held the leadership of the republic until the beginning of the Karabagh movement contributed to topple him. He would reinvent himself as a politician in post-Soviet times for a brief period until his murder. Demirchyan was born on April 17, 1932 in Yerevan, in a family of employees. He lost his parents when he was still an infant. After graduating from the school “26 Commissars,” he chose a career in engineering and studied at the Yerevan Karl Marx Polytechnic Institute (now Yerevan State Engineering University) from 1949-1954. After graduating as mechanical engineer, he worked briefly for a research institute in Leningrad, and in 1955 he returned to Armenia and joined the Yerevan Electrotechnical Factory. He became a member of the Communist Party in 1954 and soon rose to the position of secretary of the party committee in the factory. His political career was in progress. In 1959 he was sent to the higher party school of Moscow attached to the Communist Party of the USSR, which was a prerequisite to climb to higher echelons, and he graduated in 1961. He returned to his former workplace as chief engineer and later director. In 1964 he became second secretary of the Yerevan party committee and joined the secretariat of the Armenian Central Committee six years later. 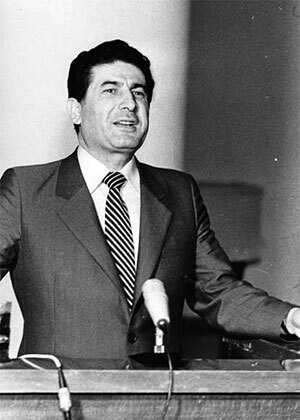 Demirchyan replaced Anton Kochinyan as first secretary of the Armenian Communist Party in November 1974 and he also became chairman of the Armenian Supreme Soviet in 1976. During his fourteen-year rule as party boss (he was one of the longest holders of the position of first secretary), Armenia was prosperous by Soviet standards, with its economy helped by semi-legal and illegal businesses. Various important public works were finished and opened during his tenure: the Zvartnots airport in Yerevan and the Shirak in Gyumri, as well as airports in the border zones; the first section of the Yerevan Metro (subway); the atomic central of Armenia, in Metzamor; the sports-concert complex on the hill of Tsitsernakaberd; the Arpa-Sevan tunnel. Several important factories and highways were also built. On April 23, 1975, for the first time in the history of Soviet Armenia, Demirchyan officially condemned the Armenian Genocide on behalf of the leadership of the republic. Thanks to his efforts, an article that declared Armenian as official language of the republic was reinstated in the new Constitution of 1978. Demirchyan visiting the contruction site of the Yerevan Metropolitain subway. 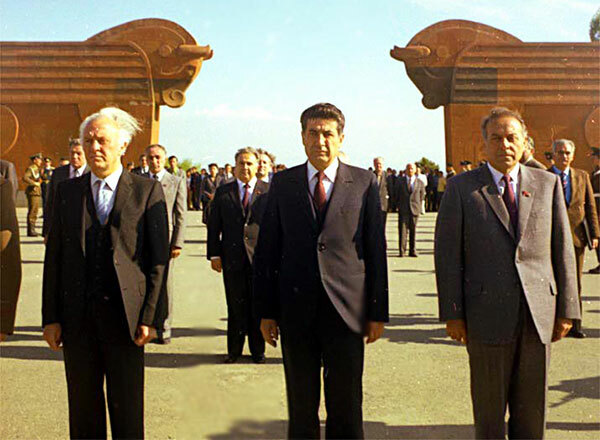 Demirchyan (center) and his Georgian and Azeri counterparts, Eduard Shevardnadze(left) and Heydar Aliev (right) at Sardarapat in 1979. At the beginning of the Karabagh movement in 1988, Demirchyan tried to persuade the demonstrators to be patient. However, his middle course did not please either side, and he was forced out of office by Moscow authorities in May 1988. He practically disappeared from the political scene, and after the independence of Armenia he became president and executive director of the Hayelectramekena (Armenian Electrical Machines) from 1991-1999. A decade after leaving politics, he made a surprising comeback. Nostalgia for his era gave him momentum to try a run for the presidency as a non-partisan in the elections of March 1998. He managed to garner 30 per cent of the votes in the first round and 40 per cent in the second-round run-off against the eventual winner, Robert Kocharyan. He later formed the People's Party, teaming up with Defense minister Vazgen Sargsyan’s Republican Party to form the Miasnutyun (Unity) alliance and contest the May 1999 parliamentary elections. 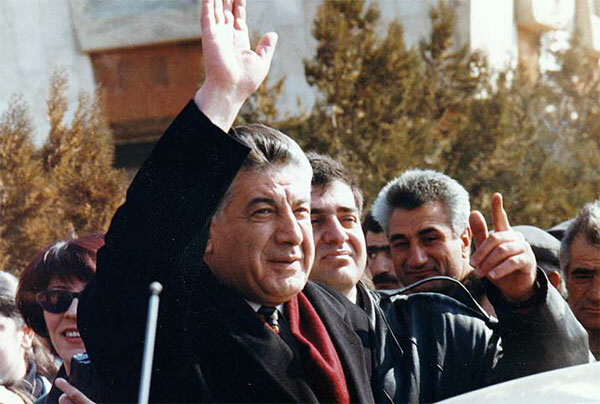 Demirchyan during his 1998 presidential campaign. The alliance won with 43 per cent of the vote and the majority of parliamentary seats. This gave the country the first chance of some stability since independence. Demirchyan was overwhelmingly elected speaker in June 1999. Four months later, on October 27, 1999, he, Sargsyan and six other politicians were assassinated in the Armenian Parliament by a group of gunmen who stormed the building in a move whose ultimate motives and driving forces have not been clarified. Karen Demirchyan is buried at the Komitas Pantheon, located in the city center of Yerevan. One of his two sons, Stepan Demirchyan, succeeded him as leader of the People’s Party. The subway system, the sports-concert complex, a school, and a street are named after him in Yerevan. The massacre of Maragha was one of the forgotten and under-reported episodes of the Karabagh war. The village of the Karabagh region was occupied and destroyed by Azerbaijani troops, the remaining inhabitants were massacred, kidnapped, or disappeared, and the village is currently under Azerbaijani control. Maragha, formerly called Leninavan, was located in the region of Martakert, just across the border from the Azerbaijani town of Terter, in the oil-rich region of Mir-Bashir, and was one of the largest villages of the region. It had a population of 4,660 people, predominantly Armenians, according to the Soviet census of 1989. The escalation of the conflict in the spring of 1992 led first to the bombing of the village, which resulted in considerable damage. Some residents fled and temporarily settled in other regions of Karabagh. Afterwards, Azerbaijani forces attacked Maragha on April 10, 1992. Artillery fire started early in the morning, followed by a ground assault from neighboring Mir-Bashir. The village was occupied in the afternoon by 20 armored vehicles and a battalion of 1,000 soldiers, reportedly followed by looters. The village had 500 residents at that time, according to the data of Human Rights Watch (HRW). A preliminary report published in 1992 by HRW noted that the 60 Armenian fighters who defended Maragha did not have adequate weaponry and had been unable to hold their positions. They had retreated to a spot overlooking the village. Previously, they had notified the villagers, who had mostly left, while the remaining civilians, mainly consisting of the elderly and disabled, had gone into hiding in basements and underground shelters. The Azerbaijani forces massacred the civilians. The Armenians retook the village the following day, and came across bodies of forty-three civilians, mostly mutilated. Maragha was attacked again two weeks later. The remaining population was deported, and thirteen civilians were taken hostage. The houses were pillaged and burnt down afterwards. As a result, most of the village was destroyed, and the bodies were later buried in a mass grave near the village. Amnesty International reported that a total of over a hundred residents had been slain, their bodies profaned and disfigured, and forty-five residents (including nine children and twenty-nine women) were taken hostage. The Azerbaijani officers directly involved in the massacre were never held responsible or tried for the crimes committed in Maragha, while the Azerbaijani side has not responded to the accusations of massacre. The events in Maragha were not covered by the international media. Cox explained that she had not brought journalists together with her to Maragha on those days because it was dangerous, but she took many photographs, which are printed in her book Nagorno Karabagh: Ethnic Cleansing in Progress. Cox also said in her interview that the English newspaper Daily Telegraph had agreed to print her report on the massacre of Maragha, but then they refused to do so. The village is currently controlled by the Azerbaijani army, and its former residents now live in Russia, Armenia, and other areas of Mountainous Karabagh. The residents who stayed in Karabagh have built a village on the ruins of another village now called Nor Maragha (New Maragha), not far from the destroyed hometown. A monument in the new village commemorates the victims of the massacre. General Tovmas Nazarbekian was one of the main names in a host of Armenian officers that served in the Russian army and helped found the Republic of Armenia in 1918 with their military expertise. Nazarbekian was born on April 4, 1855 to a Russianized Armenian family in Tiflis, the capital of the viceroyalty of the Caucasus. He graduated from the military gymnasium of Moscow in 1874 and from the Alexandrian Military School in 1875. He participated in the Russo-Turkish War of 1877-1878, earning the Order of St. Stanislaus for his contribution to the occupation of the fortress of Ardahan and the Order of St. Anna for distinguished service in Erzerum. He was promoted to the rank of colonel in 1902, and awarded the Gold Sword for Bravery for distinguished service during the Battle of Mukden in the Russo-Japanese war of 1904-1905. Nazarbekian attained the rank of major-general in 1906. He renounced his commission when the Russian policy turned against the Armenians in the period 1908-1912, but returned to the army when this anti-Armenian was abandoned. He had an important role in the Caucasian front after the outbreak of World War I. He was commander of the second artillery division of the Russian army, which included the Armenian volunteer battalions. He achieved an important victory in the Battle of Dilman (April 1915), which helped stop the advance of Ottoman forces commanded by Halil Pasha into Persia. He also commanded the forces that occupied Bitlis in the winter of 1916, and took his army down through the mountains of Western Armenia to the plains of Mush, capturing the homonymous city. His achievements earned him the admiration of military critics. He supported the British Mesopotamian Army by disrupting Ottoman supply lines, and established the outposts that made possible the further advance of the British in the failed Mesopotamian campaign of 1916. Nazarbekian was decorated by the French government for his achievements. General Nazarbekian with officers in his army. The chaos caused by the Russian Revolution in 1917 stopped all military operations and the Russian regular troops withdrew from the frontline. The situation brought forward the formation of the Armenian national corps under the command of Nazarbekian. The Special Transcaucasian Committee (Ozakom) negotiated the armistice of Erzinga with the Third Ottoman Army on December 5, 1917, freezing the conflict until February 7, 1918. By the end of January, 1918, Nazarbekian's divisions occupied the major positions from Yerevan to Van and Erzinga. Despite his resistance, he had to follow an order by the president of the newly formed Transcaucasian Parliament (Seim), the Georgian Akaki Chkhenkeli, and abandon Kars to the Ottoman advancing forces in April. Under his leadership, in late May 1918 the Armenian troops defeated the Ottoman forces in the battles of Sardarabad and Pash-Abaran, and stopped their advance in Gharakilise. Nazarbekian was appointed the first Chief of the General Staff of the Armed Forces of the first Republic of Armenia. He continued his military service to the homeland without leaning to any political party. He used his knowledge and experience to aid in the creation of the Armenian national army. He established a special uniform, instead of the Russian uniform, and instructed to translate the military code into Armenian. The orders were issued in Armenian. He was appointed Chairman of the Military Council on March 25, 1919, and awarded the rank of Lieutenant General on July 15 in the same year. After the sovietization of Armenia, in January 1921 Nazarbekian was arrested, together with 1,200 Armenian officers, and exiled to Moscow and then to Riazan. He was released four months later after an amnesty. He settled in his hometown, Tiflis, where he lived quietly and wrote a series of memoirs about his campaigns from 1917-1918. He passed away on February 19, 1931.